The EPSRC UP-VLC Programme Grant partnership was ‘highly commended’ as runner up in the Information, Data and Connectivity category at The Engineer magazine’s recent Collaborate to Innovate competition. Further information can be found on The Engineer magazine's website. On the 4th of May 2016, we held an open day at the Royal Academy of Engineering, London. On display were twelve demos and a series of talks showcasing work from across the entire project. Our keynote speaker was Nobel Laureate Hiroshi Amano, who gave a talk titled "Lighting the Earth by LEDs". The event was a great success with over 100 guests from academia, industry and other organisations in attendance. 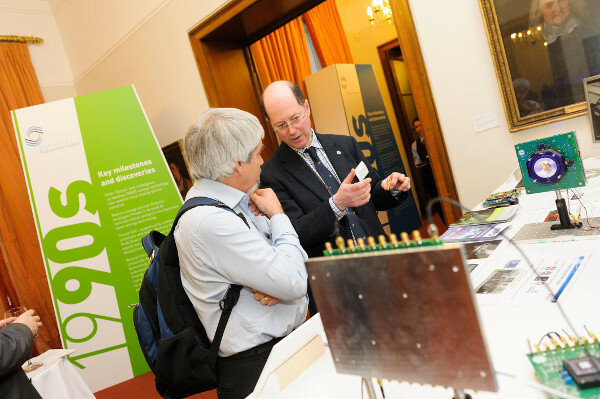 The UP-VLC consortium was represented at the EPSRC-organised event, "Science for a successful nation", which was held at The Royal Society, London, on the 2nd of March 2015. The event was held to celebrate 50 years of EPSRC and it's predecessors, and aimed to highlight the importance of long term investment in engineering and physical sciences. Our most recent optical communication demonstrator system, consisting of a CMOS-driven micro-LED array transmitter and a CMOS-based avalanche photodiode array receiver, was shown to an invited audience of influential policymakers, business leaders and leading UK academics.